Imagine a restaurant that wants specific music in the dining room to set an appropriate ambiance, the waiting area to decrease the perceived wait time, the back room to motivate employees, and the bar to increase drink consumption. Many businesses want to be able to choose the music genre that plays in the various rooms within their locations. Yet traditionally, business music software solutions were built around playing just one source of music at a location. And what happened to a location that needs multiple sources you ask? Welcome to a tricky, time consuming, and expensive audio nightmare. We heard our customers and are excited to introduce a brand new solution called Zones. What is a Zone and how is it different from a Location? Zone = a stream of audio within a location that has one single street address (i.e. lobby, showroom, breakroom, etc.). 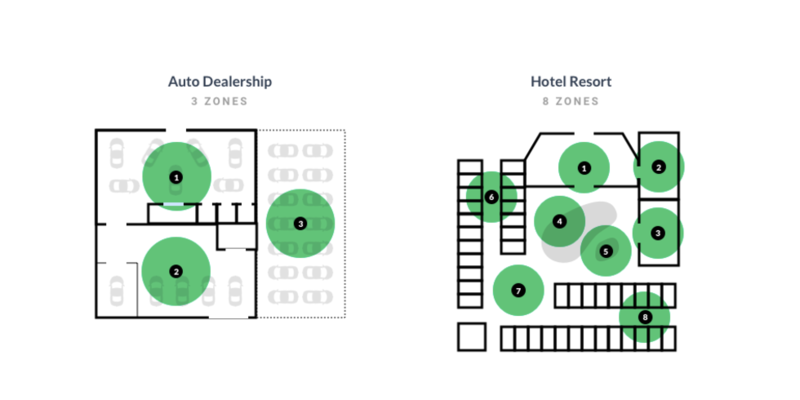 One location can have multiple Zones. Whether your business location needs music in two rooms or a dozen, Zones has you covered. 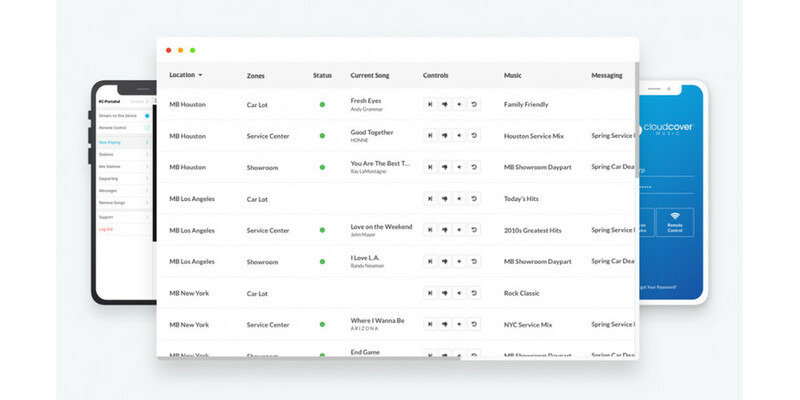 Zones allows you to easily setup and manage music playlists for multiple areas on any streaming device, and remotely control them with only a few easy clicks from a web browser or mobile app. And the best part? Cloud Cover offers it at a lower price point per area than just about any other business music provider. Simply sign up for our Manage or Messaging plans and each additional Zone will be $17.95/mo ($16.16/mo on an Annual plan). Bonus: We do offer a 14-day free trial – no credit card required and no long-term contracts. If you're already a Cloud Cover subscriber login to your account and click here to upgrade to the Manage or Messaging plan. If you would like to add a Zone, click here. We’ve redesigned the player to be more modern, intuitive and easy to use. Login to your account and you can find it at the bottom of your browser. You'll also notice that you can toggle between Stream and Remote mode, which comes in handy when you're controlling the music for another Zone at your location. For business owners who are constantly on the move, having the ability to remotely control your account and zones is paramount. We know your time is valuable! 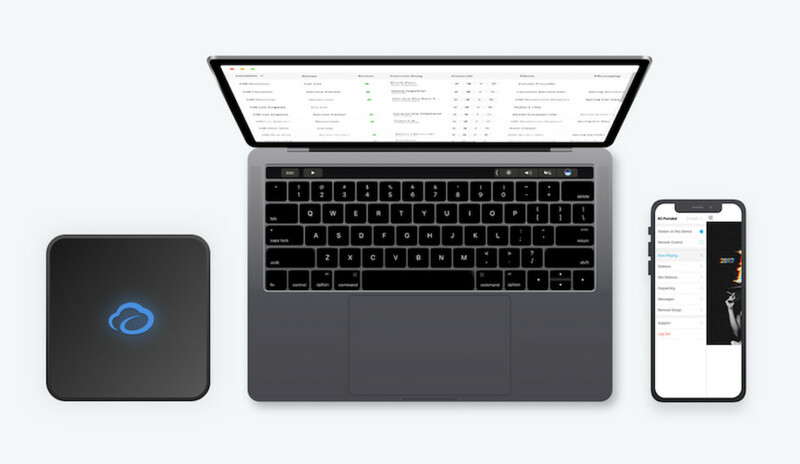 Our Manage and Messaging plans provide executives with a separate Master Admin that can remotely and swiftly switch the music, pick different messages to play, or change the volume quickly from one account for multiple locations at any time from a web browser (laptop or mobile device). If a regional manager receives a call from a store location that needs the music volume adjusted, it’s now just a few clicks away. Voila! The Zone is now playing the new station (ex. 2000s Greatest Hits). For more detailed tutorials, please visit our Help Center. Ready to check out Zones and the new player? Head over here. Don't have a Cloud Cover account yet? No problem. We'd love to have you sign up for a 14-day free trial (no credit card required).